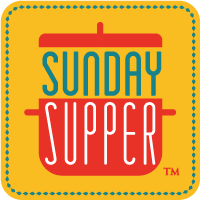 This week’s #SundaySupper theme is Squashin’ Winter featuring winter squash recipes and is hosted by girlichef. I had originally planned a sweet butternut squash recipe but as you can see there are plenty of butternut squash recipes below so I decided to go with spaghetti squash. Cut squash in half lengthwise. Scoop out the seeds. Place cut side down in a microwave safe dish. Cook on high for 10 to 15 minutes or until flesh is tender. Scrape flesh with a fork and set aside. Brown the sausage in a large skillet over medium high heat. Drain off excess fat. Add the mushrooms and onion to the sausage and cook for about 5 minutes or until the onions and mushrooms are tender. Add in half and half. Bring to a boil, reduce heat, and simmer until the sauce has thickened slightly. Add the cheeses to the skillet and stir until melted. Toss with the cooked spaghetti squash and garnish with more Parmesan cheese and parsley if desired. Black Bean Pumpkin Soup from What Smells So Good? I really like spaghetti squash and yet my husband is not so much a fan of it. However, this may just be the dish to change his mind. It’s rich and hearty and I think it will be a hit. At least it will be worth trying so I can enjoy it. You have to love spaghetti squash! It’s a perfect low carb treat and your sauce looks dynamite! I love it! Looks delicious and perfect for the Fall! Spaghetti squash just edges out Butternut on most days as my favorite anyway, so I’m happy that you shared this dish. The only thing that would make me happier is if I could have a plate for myself. Absolutely delish. Love the Italian sausage and mushroom combination with the squash, sheer genius!! YUM!!! YUM! Spaghetti squash is actually my favorite…and the creamy sausage sauce topping sounds divine! I haven’t cooked much with spaghetti squash, but my husband loves it. I definitely need to work with it more. Thanks for a great recipe! I am always looking for new ways to prepare spaghetti squash and this sounds great. I love spaghetti squash, and that sausage sauce sounds great! My daughter and I love spaghetti squash! This recipe sounds amazing and I will definitely be trying it soon. Did you know it is next to impossible to find spaghetti squash in England?! I have been told some places in London sell it but I can’t find it anywhere here. I have decided to try and grow it next year because I love playing around with it so much. Spaghetti squash is definitely one of my favorite winter squash varieties to enjoy! I never stuffed spaghetti squash this looks so good Micha!